Makerspaces in libraries is getting a lot of attention lately. Although well received and implemented in public libraries, academic libraries are still trying to explore what they can do with makerspaces. A number of makerspaces in academic libraries centred around cutting edge technology like 3D printing and multimedia editing tools. But makerspaces is more than that. 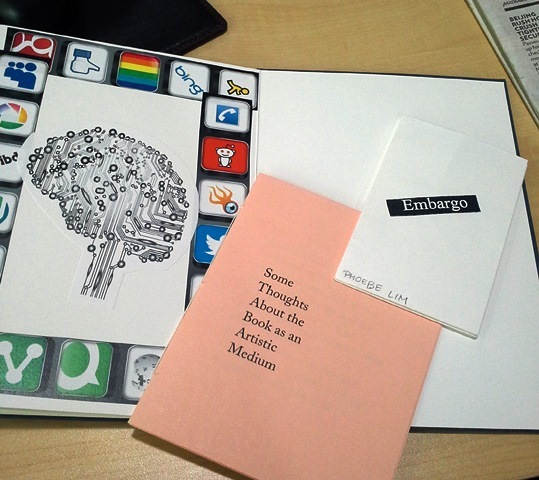 This Bookings: Making Makerspaces for Artists’ Books workshop explores the possibility of developing a makerspace focused around the book. This implies offering space and having equipment and tools in the library necessary for making artists’ books. By making 3 types of handmade books through folding, cutting, stitching and gluing, I get a quick feel of what is needed to offer this type of makerspace. I cannot imagine setting up a bookmaking makerspace in my library. At least not yet. It seems to be too much like competing with the workshops and studios in the school. Unless the library is offering equipment and tools that the school isn’t offering. But I am interested to find out how the library can serve as an incubator or a springboard for creativity and innovation besides offering books and information. Hope the following readings will help give me some ideas. Waytt, Neal. Biblio-Maker Spaces: Books as Objects of, and Inspiration for, Art.” Library Journal Reviews. Library Journal, 2014. Web. 28 May 2014.